What do an industrial kitchen, a modern bathroom, and a contemporary kitchen have in common? Kraus offers a huge variety of high-quality bathroom and kitchen fixtures at affordable prices. 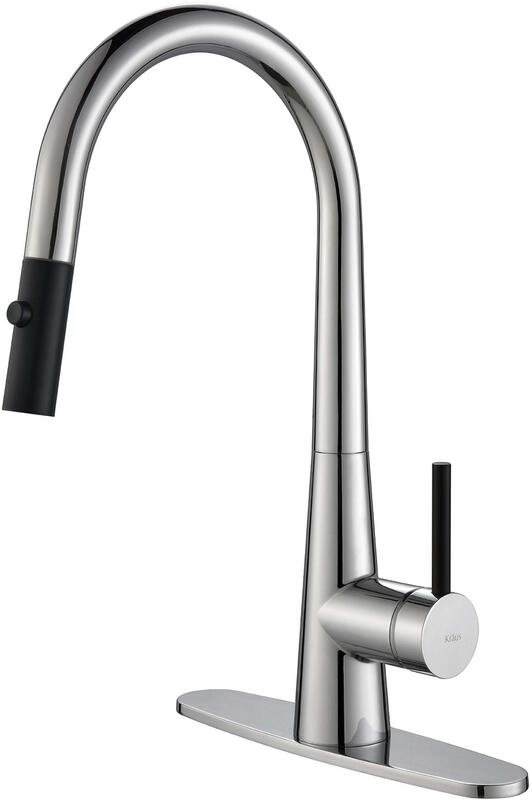 Their newest products, like all Kraus faucets, offer impeccable style, excellent quality, and awesome value. We’re highlighting these products because we’re just so excited to have them and can’t wait to share them with our loyal readers. First, there’s the Ino series bathroom faucet for the modern lover. Its sleek, organic, striking silhouette delivers a natural stream-inspired flow; the simplicity and beauty allows it to complement a bathroom of any style. The Ino faucet is available in three finishes – chrome, brushed nickel, and oil-rubbed bronze – and three versions: a rounded two-handle model and a sharply angled single-handle in two heights. 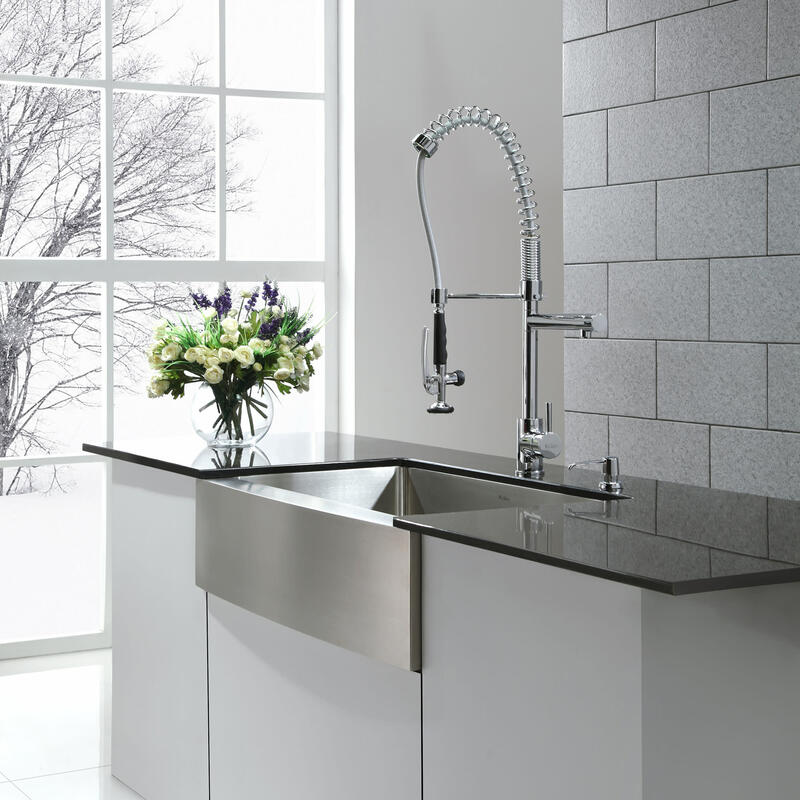 Moving into the kitchen, every chef – from the amateur specializing in Wacky Mac to the MasterChef wannabe to the Michelin-starred pro – will fall in love with Kraus commercial-style kitchen faucets. 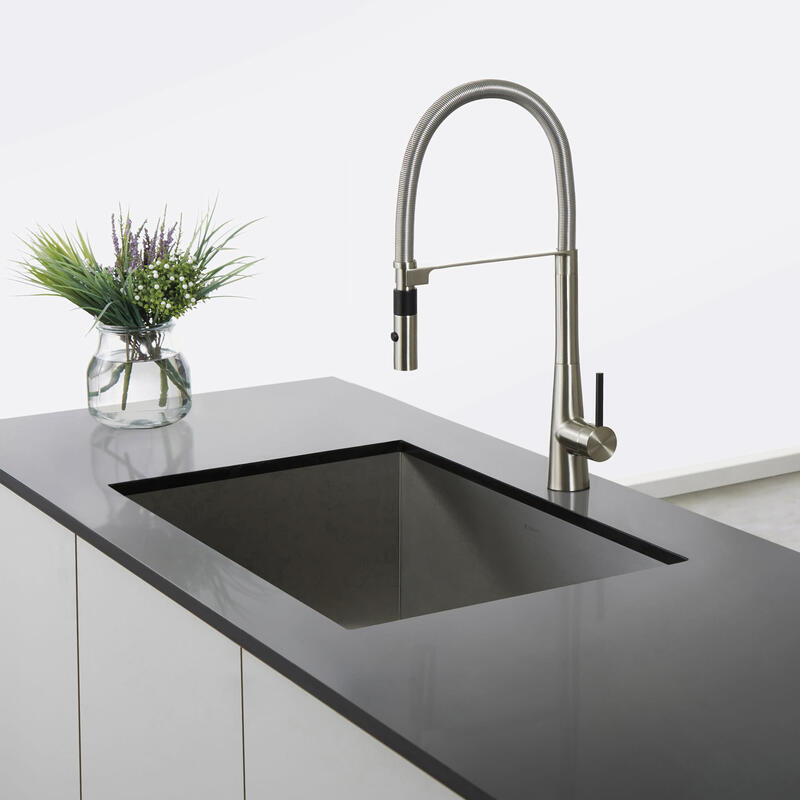 The culinary faucet has made a comeback for its dramatic style and versatility regardless of the level of food prep taking place in the kitchen, and these faucets are both fashionable and practical. 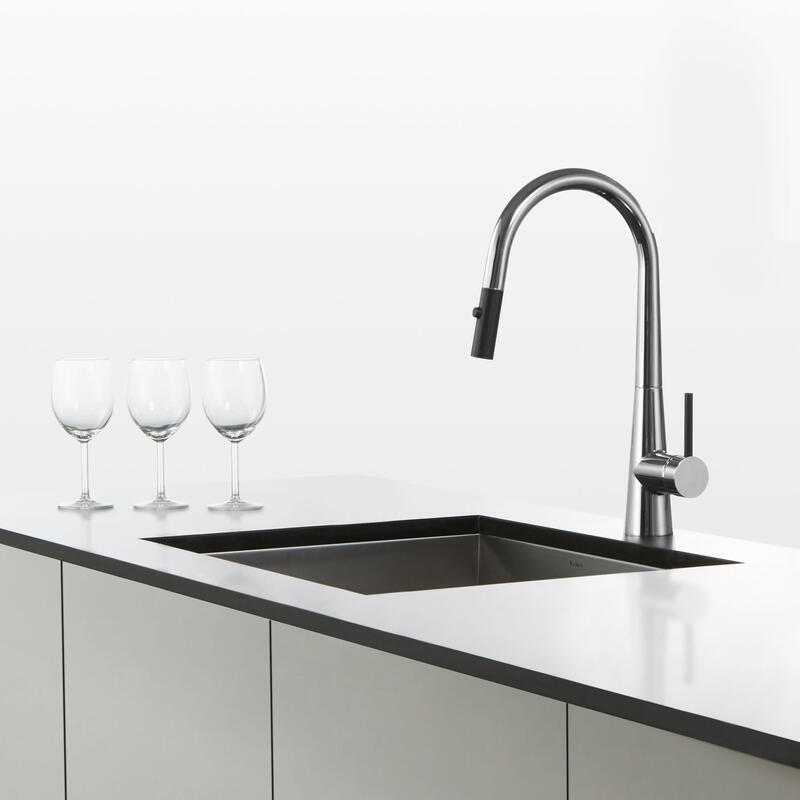 Kraus commercial faucets feature a top-of-the-line Kerox ceramic cartridge – tested to withstand 500,000 cycles – for the best possible performance under pressure. 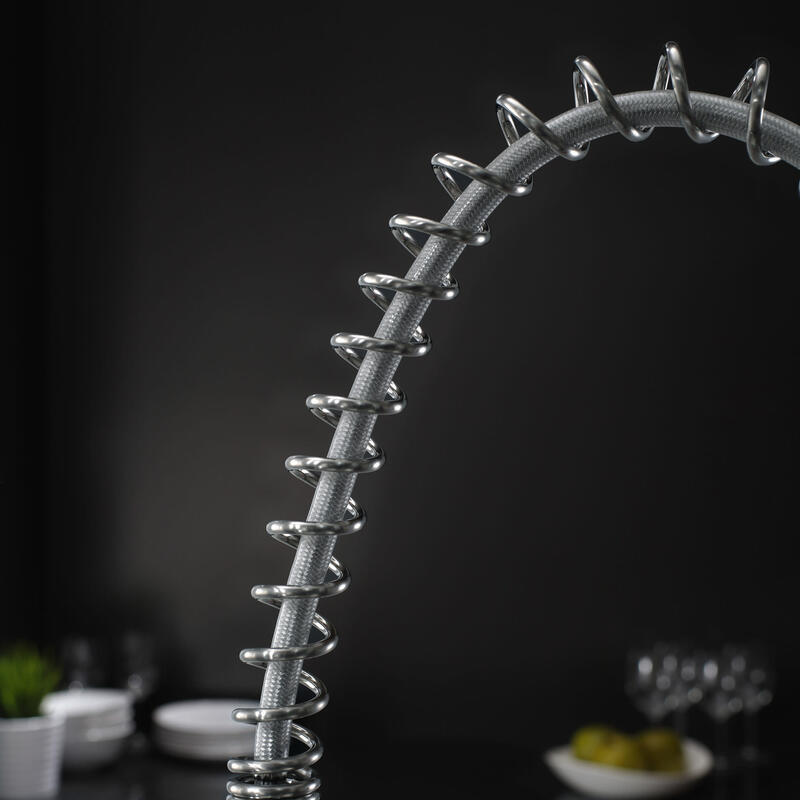 For added usefulness, the faucet features 360-degree swivel, pull-down spray head, easy-clean rubber nozzle, pre-rinse spout, and pot filler; it’s the Swiss Army Knife of kitchen faucets! And to top it all off, it looks great, too. If the industrial look is not your thing, check out the Crespo series. 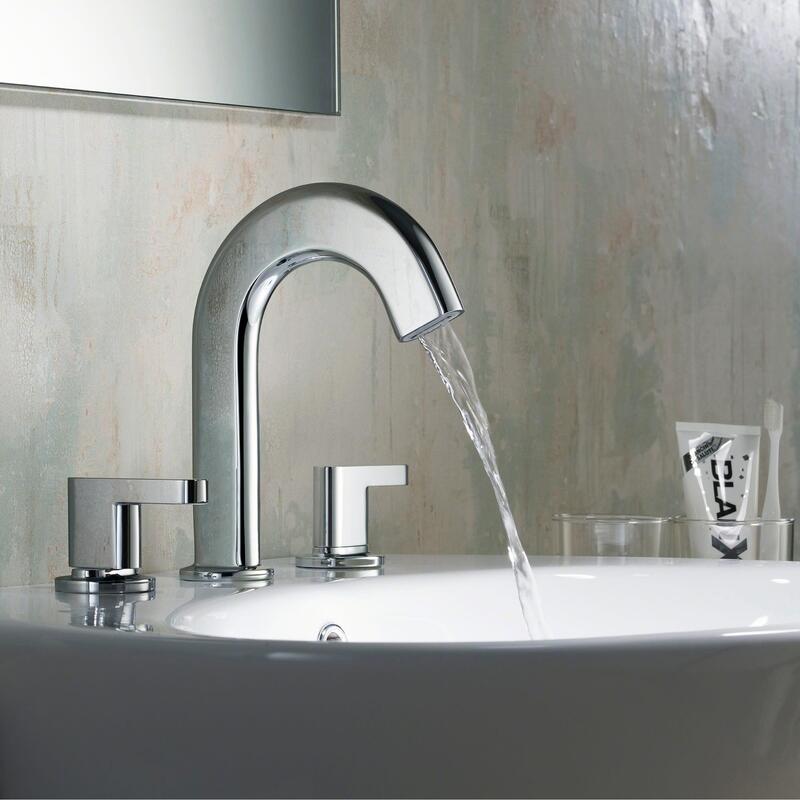 These streamlined high-arc faucets are striking in their simplicity. 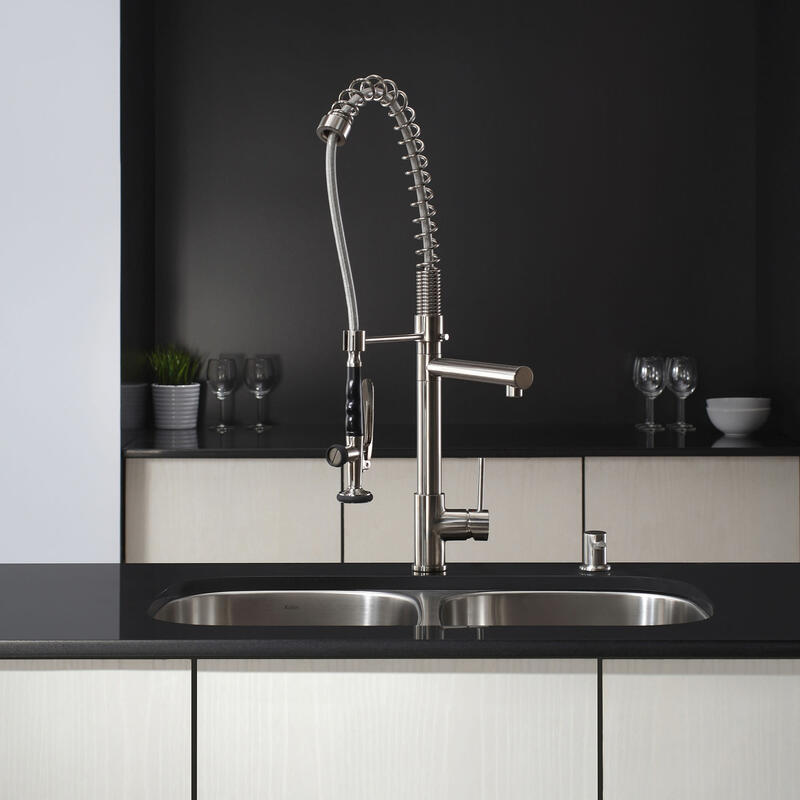 With its all-metal – chrome or stainless steel – body and black handle and nozzle, the Crespo faucet is an elegant addition to any kitchen. 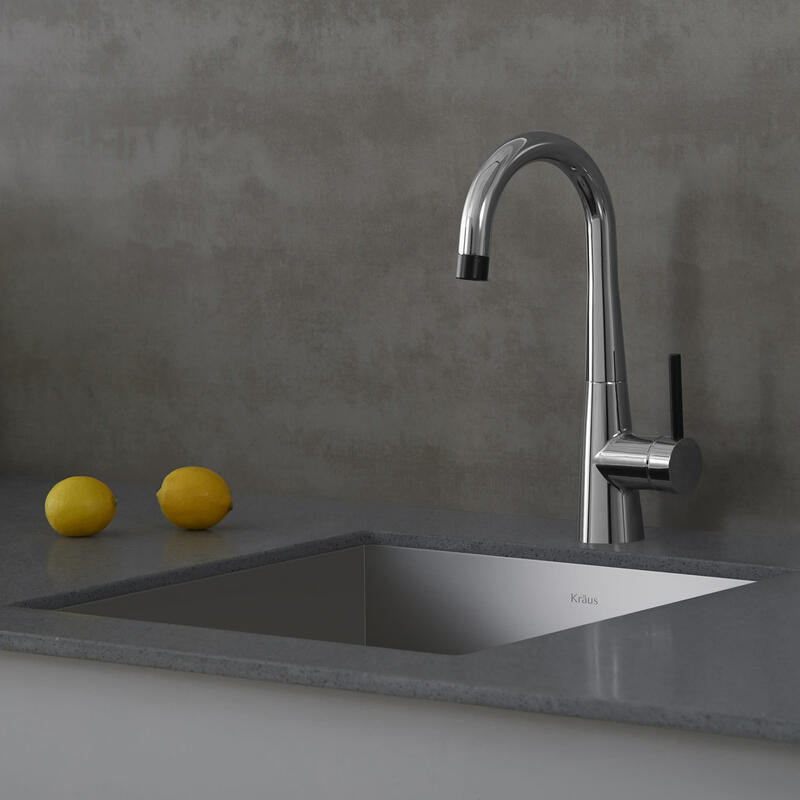 Like the commercial faucets, the Crespo is equipped with a durable Kerox cartridge for drip-free use, a unique silicon nozzle to prevent limescale and hard water deposits, and a best-in-industry Neoperl aerator to reduce water waste without sacrificing pressure. 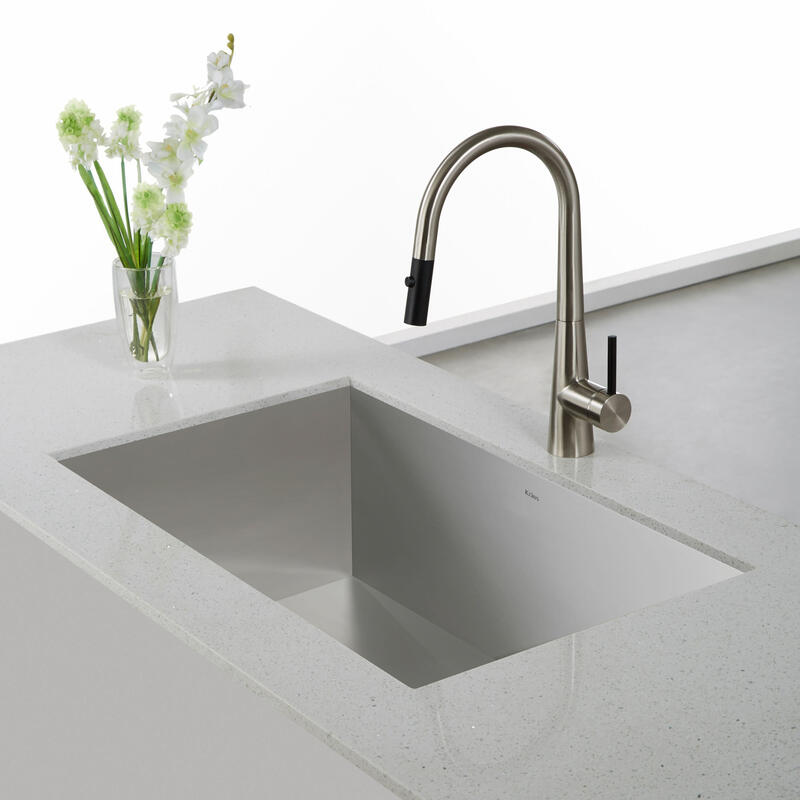 Every one of the three versatile Crespo faucets can be installed professionally beneath the sink or with its simple DIY QuickDock mounting assembly. Even the least handy homeowner can easily drop the faucet in above the counter while preserving its quality and appearance. 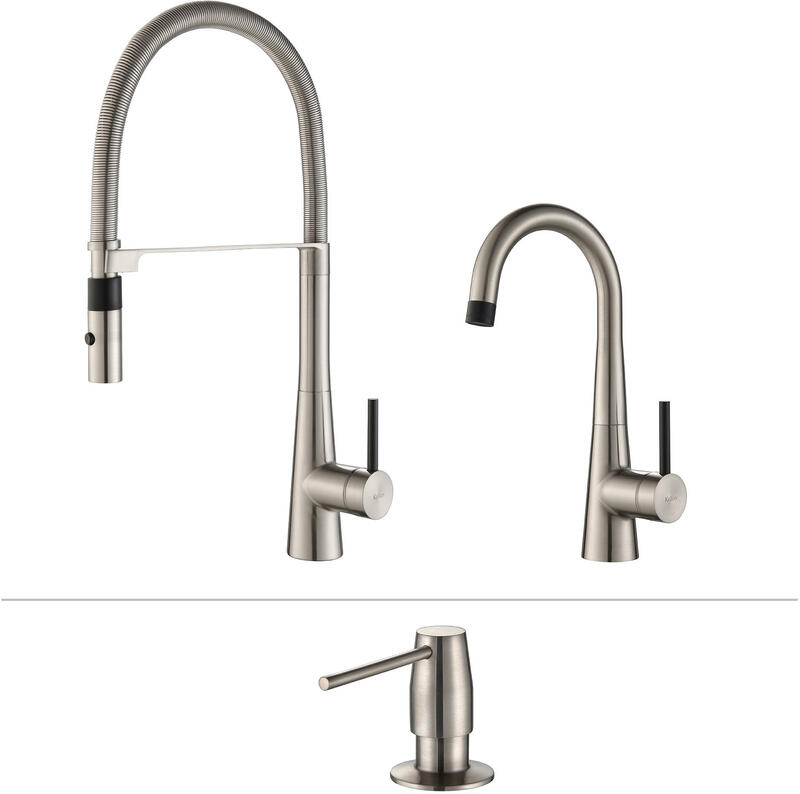 Which of these Kraus faucets is your favorite? We can’t choose!